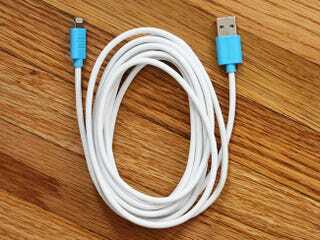 We've organized a special discount for Lifehacker readers on this epic lightning cable. How can a lightning cable be epic? When it's 10 feet long, that's how. This is the ultimate stocking stuffer – now you can charge a phone from across the room. Lifehacker readers can get one with free shipping for 52% off – just $18.99. If 10 feet seems like overkill, consider those long drives when people in the backseat can't charge their phones. The 10 feet also come in handy in cramped office environments and when your favorite café needs to becomes a charging station. Just as importantly, the quality of this Lightning cable is first rate — it lives up to Apple standards, and has MFi certification to prove it. Bonus – Android people feel like you're missing out? StackSocial also has a deal for 47% off a 6 foot, 2-in-1 charging cable. With adapters for both Android's micro USB and Apple's lightning cable (MFi certified), this cable is perfect for people with multiple devices.